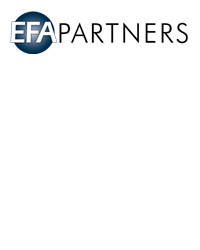 EFA Partners of New York City (Ralph Willis, Kenny Favre): EFA Partners is a financial advisory and capital placement firm focused on a broad range of industries encompassing the entertainment and media sectors, including film exhibition, leisure and various media industries. Senior leadership has over 60 years of finance experience in these industries and has closed and managed over $5 billion in transactions. Since its founding in early 2009, EFA has represented over 50 companies in arranging senior debt, subordinated debt and equipment financing for various corporate purposes and advising on merger, acquisition and general business strategies. EFA Partners' offices are located in New York and Atlanta. Ralph has been in the finance sector for over 25 years. Prior to forming EFA Partners in 2009, he was a Managing Director for GE Capital where he founded and led the entertainment unit of the media finance business for five years. He was responsible for leading a team of sales and risk professionals that closed and/or managed over $3 billion in transactions to the entertainment sectors including film exhibition (theatres/digital cinema/3-D/alternative content), leisure (theme parks/ski resorts/Family Entertainment Centres (FEC)/sports), production (film/music/video games) and casinos (Las Vegas/regional). From 2001 to 2004, Ralph was with GE Capital as a Managing Director and responsible for leading teams of risk professionals that managed a $500 million entertainment/media portfolio and a $500 million distressed debt portfolio. He was with Heller Financial from 1999 to 2001 where he was a founding member of Heller’s EMX group that focused on the entertainment and media sectors. Mr. Willis has held finance positions with Gilman Financial Services, the financing unit of a privately held paper company, and with CIS Corporation, a technology leasing company. Kenny has over 20 years of experience in entertainment finance and entertainment production. Prior to forming EFA Partners in 2009, he was with GE Capital from 2001 to 2008. His most recent role there was Vice President of Originations in the entertainment unit of GE Capital’s media finance business that closed and/or managed over $3 billion in financing to the entertainment sectors including film exhibition (theatres/digital cinema/3-D/alternative content), leisure (theme parks/ski resorts/FECs/sports), production (film/music/video games) and casinos (Las Vegas/regional). The group delivered a unique perspective to its clients through its relationship with GE Capital’s sister company, NBC Universal, and Kenny was instrumental in establishing a wide network of NBCU relationships in the digital cinema, film production, film services, video games, music and sports sectors. Prior to this, Kenny was a portfolio manager with GE Capital managing over $500 million in investments in the media, entertainment, technology and industrial sectors. From 1999 to 2001, he was with Heller Financial’s EMX group that provided financing for the entertainment and media sectors. He was primarily responsible for underwriting new investment opportunities and managing the group’s portfolio.